Barbed Hook Private Room is a player apartment in Skywatch. Although similar in size to the staple inn rooms, this room has a fireplace. It can purchased for 0001100011,000  after completing A Friend In Need. Or you can purchase it for 00600600 (00800800 furnished) without completing the quest. 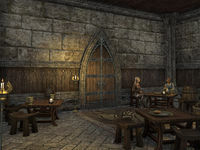 This apartment was added to the game world in Update 12, replacing an office room in the tavern. 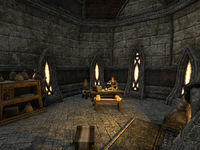 Contrary to the description, this apartment isn't necessarily all that appealing to a would-be criminal (at least no more-so than the average home), since guards do regularly patrol the docks, and there is no Outlaws Refuge in Skywatch.